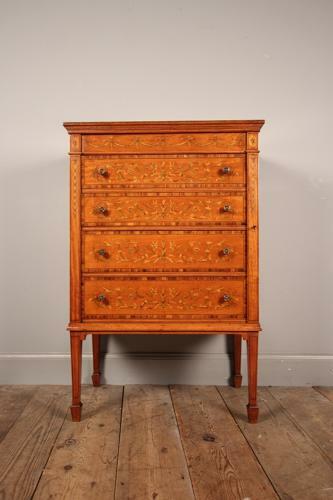 An outstanding fine quality Satinwood Wellington Chest on Stand of superb small proportions. Having profusely inlaid drawer fronts and locking bar. The drawers all retaining the decoractive brass knob handles, Mahogany lined and a polished finish to the inside. Flanked by 2 locking bars (one dummy) and inlaid with harebells, retaining the original Chubb lock and key. The Wellington Chest polished to al four sides with Ebony line inlay to the back, sides and legs. The inlay used to decorate this beautiful Wellington consists of Sycamore, Ebony, Boxwood and Kingwood cross-banding. English Circa 1900 and atb. to JAS Shoolbred, London.